This is our creek. The trees are Blue Gums (Eucalyptus Globulus) reputed to be a local variant peculiar to the Jeeralangs where we live. Up in the top of the one on the left this morning was this little fellow, again common to this area (and also reputed to be a peculiar local variant of koala. You may not realise that I have always called these critters ‘coal-a’ bears having been taught to do so by an old family friend, Max Saunders when I was very young. I still see his point. They are not so numerous around here that they have eaten out all the gums as happened at Cape Otway. Prior to 1914 they were harvested for their fine skins until they were quite rare. Today they cannot be culled no matter what happens to their populations. 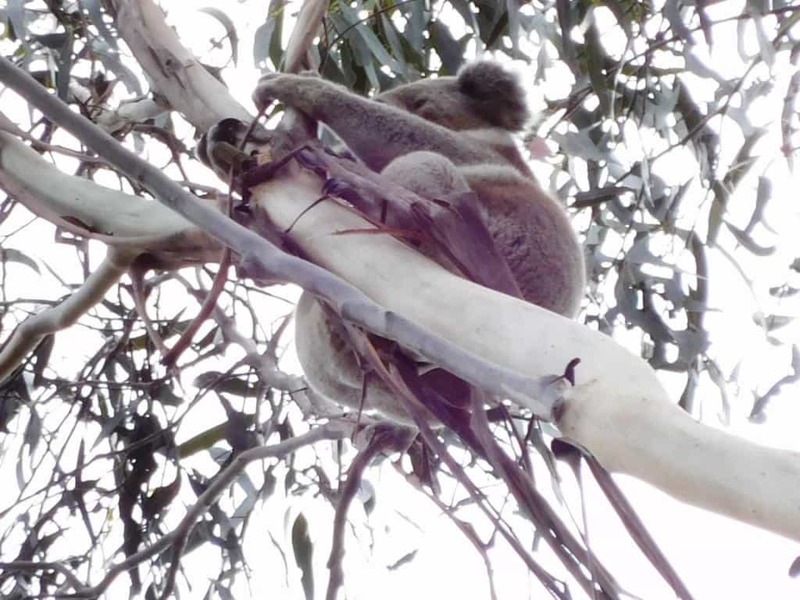 They are/were starving alarmingly at Cape Otway last time I was there (2013). You rarely notice them, as they are hard to spot up a tree and usually move around after dark. My attention was drawn to this one this morning when I was checking a pump, as he was roaring: they have a surprisingly loud call which carries for hundreds of yards, sounding something like a camel in rut which no doubt you are more familiar with! Evidently when you start to notice them, they are already becoming too numerous (and maybe should be culled for those lovely skins!) as it was over twenty years after the First Fleet before anyone even saw one!